The Model 109020 1-Channel Receiver is designed for use in residential garage door operator applications. Typically the receiver mounts directly to the three terminals on the door operator. An 11-inch wire antenna extends from the receiver. The operator supplies 24-volt power to the receiver, or the receiver can be powered by a separate 24-volt AC power transformer. Remote power accessories available for the Model 109020 include the Model 109201 Wiring Harness and the Model 109207 Wiring Harness. Both models include a plug-in transformer. The receiver's exclusive two-way terminal lugs fit under terminal screws or can be used with push-on terminals in remote placement applications using the Model 109206 3-Wire Adapter. The receiver is programmed with a 10-position coding switch. When a Multi-Code transmitter set to the same code is activated, the receiver's output will activate, triggering the door operator. 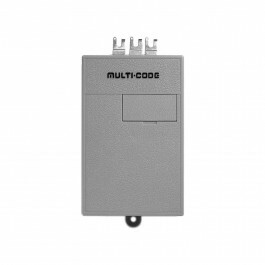 The Model 109020 is compatible with 300 MHz Multi-Code transmitters only.